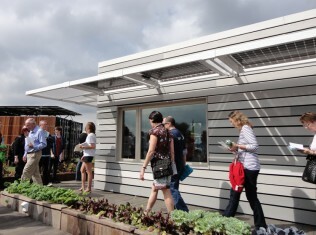 The University of Illinois at Urbana-Champaign built the Re_Home for the 2011 Solar Decathlon. The idea behind the home is that it can be trucked into a disaster area to provide rapid housing for families without a home due to fire, tornado, flooding or other natural disaster. The Re_Home was built by the University of Illinois at Urbana-Campaign for the 2011 Solar Decathlon. The roof hosts 24 monocrystalline photovoltaic (PV) panels on the top of the home, while there are also 6 bifacial PV panels used as a continuous awning on the southern side of the home; both PV aspects combine for a 7.2 kilowatt array. The solar panels on the roof can be transported flat, then raised to an optimum angle when on site. The home was built to be energy efficient according to the Passive House standard (explained below). The home was built using modular construction. Standard 2x4s with spray-in foam insulation were used to construct the wall, then the structure was wrapped with rigid foam insulation to make a super-tight envelope for the home. Partly as a result of the layers of insulation, the home performed well and achieved net-zero Energy Balance. Bifacial photovoltaic panels provide shade for the southern facing windows. On the way to tour the house, visitors walked past a porch lined with growing boxes filled with various types of lettuce. This is one of the aspects that the team thought about for the disaster aftermath scenario – that vegetables can be grown around the house. The siding on the home is biodegradable and is made from corn husks (60%), salt (22%), and mineral oil (18%). (According to the the team’s SolarDecathlon.gov web page.) It’s very cool to have a natural, sustainable and biodegradable exterior paneling product, however, this may have a downside to it. As the salt breaks down, if the salt gets into the ground or growing areas, it may become more difficult to have a successful vegetable harvest. 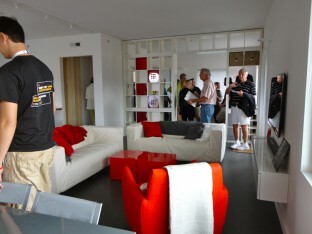 A view from the living/dining room with the main entrance, kitchen on toward the flexible space and bedroom. Upon entering the home, an open living room and kitchen space greets the visitor. 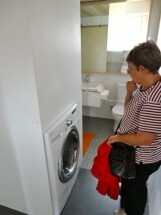 It’s important to note that the home has efficient appliances throughout it. The team placed 1st in the Appliances category. The home and its decor was overwhelmingly white – for a disaster area? The color scheme of the Re_home was quite nice. 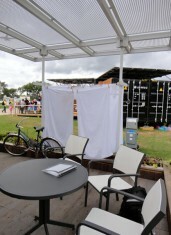 With a place to hang laundry on the porch, the home seems more like an urban loft or designer home than one that is optimized to be trucked in for a natural disaster area. Perhaps its the abundance of white furniture and accents throughout the house that could quickly become soiled in any disaster area, as tornado, hurricane or flood areas are not clean or easy places to live. Something about the idea of this home is unsettling to me. 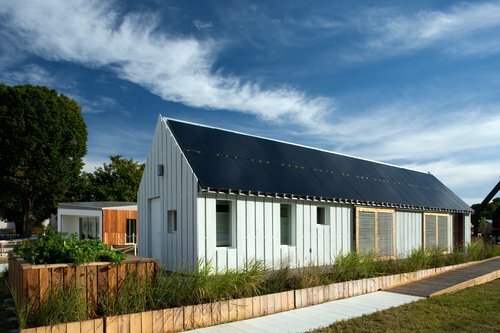 Maybe it’s the comparison to other homes that had ingenious passive solar additions like a Trombe wall – window, sliding shades for southern facing windows, student designed furniture or biowalls; while this is an efficient house, this just seemed to be a modular home that lacked creativity and – solar flair. This home is not a passive solar home, rather, it is a passive house. The bedroom for the Re_home continues with the white theme. Passive homes seek to be super tight, well-insulated homes that control the intake of air and perform the best when tightly controlled. They do not regard any outside influences of solar heat or light or any other external force. 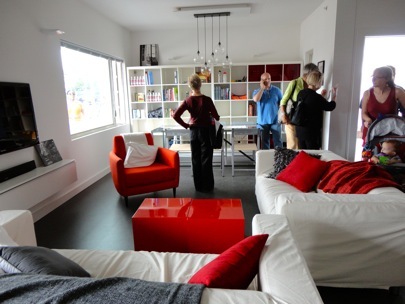 A passive house is a relatively new phenomenon. Stemming from a conversation between Prof. Bo Adamson (Sweden) and Prof. Wolfgang Feist (Germany) in 1988, the two developed an aggressive energy efficiency standard for what they called a ‘passive house’. A passive house meets 3 standards: it has heating/cooling demand of less than 15 kWh/m² per year, its primary energy consumption must be under 120 kWh/m² per year (3.79 × 104 btu/ft² per year) and it can not leak more than .6 times the volume of the house when tested by a blower door when the pressure of the house is brought to 50 Pa (N/m²). A passive house is simply a super-efficient – tightly insulated building where all airflow is tightly controlled. It does not take into account any renewable energy sources, sustainable materials used or other external forces. The view toward the flexible space, currently as an office but can be utilized for an extra bedroom. Because houses settle and are in constant motion, passive homes must constantly be recalibrated. It’s been said that Feist has more than 17 blower door tests done on his house. This type of obsession would take an extraordinary amount of time and effort for the regular home owner. All buildings will shift and settle for years after they are built. To be efficient, they should have a blower door test and as a result, be reinsulated or caulked in key points every few years. While it is very wise to have a well insulated house, the amount of time to keep a passive house within the passive house standard, seems outlandish. The laundry line faces the west and would get full sun late in the evening. Likewise, the idea of disregarding the sun’s benefits in a competition such as the Solar Decathlon seems to go against the grain. Why not take any passive solar heating and cooling into account? I like some of the colors of the house and the fact that is has a clothing line, but the clothing line is located underneath a porch covering, faces the west, and would not get full sun until early evening. 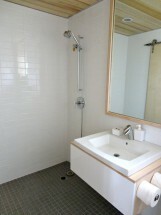 The overall appearance of the home is something that lacks coherence and unity. It appears that the outside of the Re_home looks like it was sided with different gift – donations of siding that could not be sold from the clearance bin of a siding company. With a build price of $291,800, the Re_home seems to be an expensive, temporary disaster area house. The Re_home is the third Solar Decathlon entry from the University of Illinois at Urbana-Champaign. Their second effort in 2009 led them to 2nd place in the Solar Decathlon with their entry of the Gable House seen to the right. See the gallery and video below for more information about the Re_Home. The team won 1st place in the Appliances category and tied for 1st place in the Energy Balance category, achieving a Net-Zero designation. The Re_home finished in 7th place overall in the 2011 Solar Decathlon. 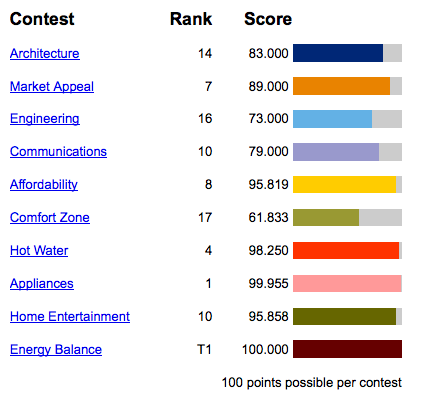 A screenshot of the final scores for Urbana-Champaign’s 2011 Solar Decathlon effort. See the video below for more information about the Re_home. This house is very expensive! At almost $300,000 for a small sf, it isn’t even feasable for a homeowner, let alone a disaster structure! With the attitude of high cost for ‘Green’, it will never be affordable…a serious problem in todays world. I agree. I found it strange to create a house for disaster areas that would realistically be temporary, yet cost almost 300,000. A new (energy efficient and very green) house could be built for that amount. 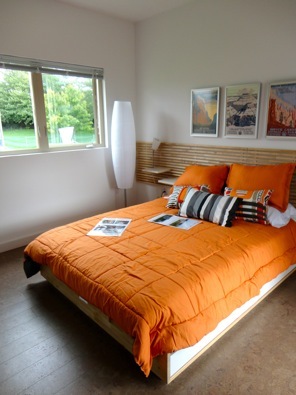 This home was one that was built for the Solar Decathlon, a competition to build a net-zero home. 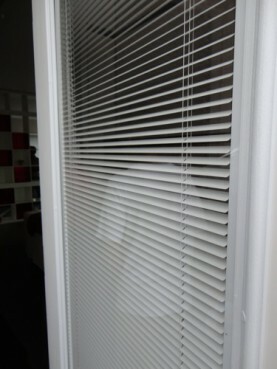 The overall cost can depend on whether or not you have the time and skills to work on the house. If not, you will often need to pay someone to work on it.